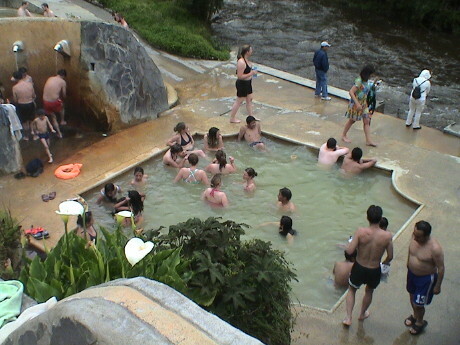 Today, the whole project boarded two busses and drove the 63 km to Oyacachi to soak in the natural hot springs. We took the road from the Hacienda south to Cangahua which was was a good road, but only for a couple of miles. At Cangahua, the road was concrete pavers, still pretty good. Just outside of Cangahua, the road turned to cobblestone. It was rough but at least by the time I took this picture of a typical farmhouse through the bus window, the window was still clear. When the cobblestone ran out after 5 miles or so, the road turned to muck as it was starting to rain. Then the bus windows got so dirty that photography was not practical. As we drove higher over the eastern range of the Andes and down the Amazon side a ways, the road became a series of potholes all the rest of the way to Oyacachi. It took 90+ minutes to make the 63 km trip. 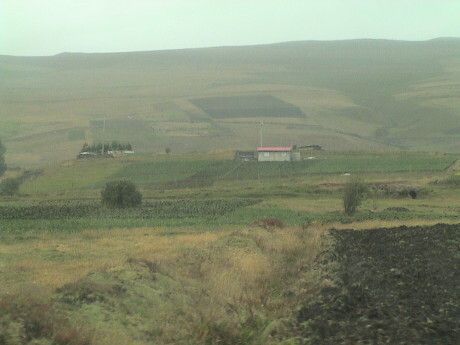 By the time we got to Oyacachi, it was overcast, cold and raining lightly. However, the hot springs were indeed very warm. There were three pools in use, one so hot that I couldn't stand it and one that was just warm which was good. A river was also right next to the tubs and it was really cold. After a couple of hours in the hot springs, we all got out and went to a trout lunch. This place fishes the trout from the river on order, we placed our order before we went to the hot springs so that they would have time to catch over 50 fish. It was a pretty good trout, but I was suffering indigestion from something I ate at breakfast and really couldn't enjoy it as much as I should have. After lunch, it was back on the busses for the ride home which actually took longer than the ride out. By the time we returned to the Hacienda, we were worn out and Sandy and I simply crashed until dinner. After dinner, I set a fire in the fireplace and settled down to write this blog entry. It turned out to be a non-work day for me. Sam had some task for me but it either was postponed or evaporated. In any event, I was not assigned to the lab or to the field. Sandy worked on ArcGIS much of the day. The project is winding down. Both the lab and field workers got a short day due to a soccer match scheduled with the local kids this afternoon. The field work is reduced to a few active units with the rest finishing up their paperwork and unit packets. Open units will be backfilled in the next couple of days both to preserve their contents and to mitigate hazards with open holes left in the ground. Friday morning, we all get on a bus back to Quito. There will be a final project dinner in Quito before they cut us loose. Many will be flying home the next day. Some of the staff are going to Belize for another 5 weeks of field school there at a Mayan site. Sandy and I will spend the next 10 days in Quito as tourists before we fly home. We don't yet know where we will be staying, possibly at more than one hotel as we grab the first night somewhere and then find more permanent digs the next day. Sandy was working in the lab this morning and I was unassigned. I thought I was going to help lay some concrete datums at the sites, but the crew left without me. At lunch, Sandy, Joani Mitchell (a Foothill student) and I took the bus to Mitad del Mundo, the marker on the equator. It is a $0.20 bus ride away. This marker is a sundial and also marks the seasons. 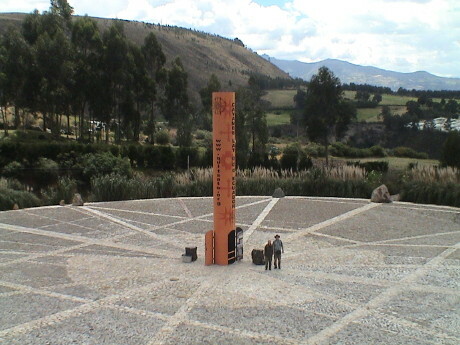 At the equinoxes where the sun is directly overhead at noon, the sun will fully illuminate the 10 meter high metal tube on the inside. At other times, it's shadow will touch lines and/or markers set around the monument. Sandy and I are standing across the equator, I am on the north, Sandy on the south. 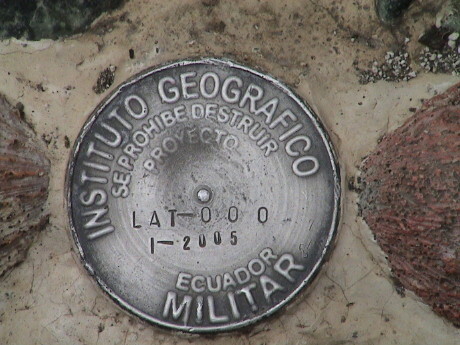 The equator line is identified by this marker set next to the monument. We got a little introduction to the site from a guide and Sandy purchased their maps, CD and DVD set. After about an hour there, were it turned from cold to hot to nice in a few minutes time, we caught a bus back so that Sandy and Joani could get back to work in the lab. I did pretty much nothing. Today we went on site tours in the morning and worked on finishing the paperwork for the work that we've done over the last month in preparation for shutting the project down for the year. First, the whole crew went out the Loma Sandoval as many of them had been working elsewhere and this was the only time that they would see it. The units that I worked on had already been filled in. Then the whole crew went to Pukarito (a combination of Spanish and Quechua which means "little fort"). I had not seen that site before. Pukarito is a hilltop just south of the Hacienda that overlooks the whole region between the Hacienda and Cangahua. It is a stiff hike directly up the side of the hill. The view is pretty good from there, but it can also get very windy on the hill. 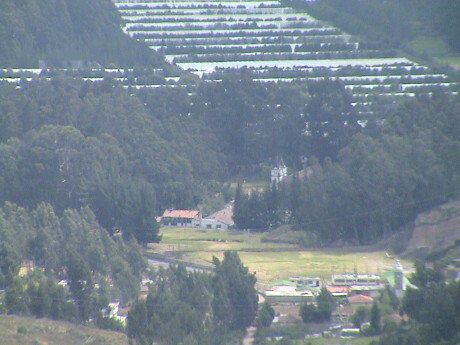 These are farmhouses across the valley from Pukarito. The view north overlooks the Hacienda Guachala as well and the rose farms beyond. 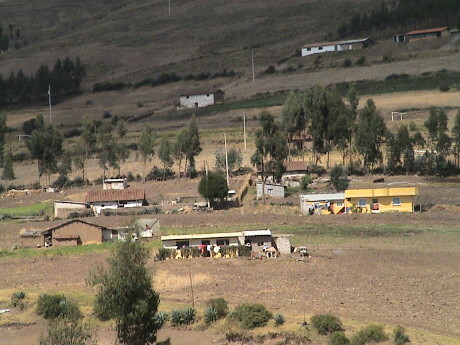 Pukarito appears to be a dual use site, first built and used by the local Caranqui tribes and then reused by the Inca once they consolidated their conquest of the area. The forts are clearly not of Inca construction but there are Inca artifacts there. During the afternoon, I helped students fill out paperwork that I had not seen before so I was maybe 5 minutes ahead of them in teaching them how to complete the packets for the units that they worked on. This pretty much finishes the actual work on the project. Late in the afternoon, Manuel, the Hacienda handyman who we had become friends with, took us up to his house in Buena Esperanza to see his guinea pigs. He raises them for food. 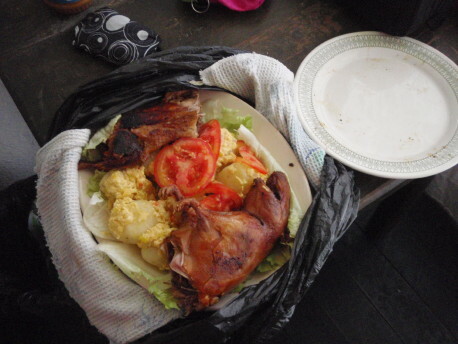 Guinea pig, called cuy and pronounced "cuie", is a delicacy here. I'll be getting some at the Casa tomorrow evening. Manuel is going to bring some for Sandy to sample tomorrow afternoon. He had lots of pigs ranging from babies to very large ones. I don't know what he gets for them but a cuy dinner at the Hacienda goes for $15. Tomorrow is our last full day on the project. I'm sure that it will be a cleanup day for stuff that got missed today. On Friday, we get on a bus to Quito where the project has reserved rooms for us for Friday night. Our work is done for today, it's free time this afternoon. We'll be resting and packing for our bus trip to Quito tomorrow. Everybody that had already finished their packets was detailed to pull all the tools out of the lab, sort them all out, inventory and clean them and then pack them up for storage until next year. After that, some of them were detailed to organize the crates of artifacts that had been collected, cleaned, and examined this year. I had a minor panic because the profile drawing that I did for units 2, 4 and 6 went missing. This was a necessary part of the closeout packages. It turns out that Kalli had it for the units 2 and 4 packages. To make one drawing work in three places, I caught a ride to Cayambe to make photocopies. Sandy hitched a ride too and in the process we got some pretty good pizza, a loaf of bread and another 2 l bottle of Coke Zero. I found my last load of laundry and started to prepack to get things into the right suitcases for the trip. We also have Sarah's GPR gear stored in our room and need to make sure that it gets on the bus tomorrow. At some point we'll settle our internet bill with the Hacienda (11 hours worth) and be ready to leave. In the late afternoon, Manuel brought by a cuy dinner that Sandy and I shared with some other members of the project. There isn't a lot of meat on a guinea pig, but it's good. 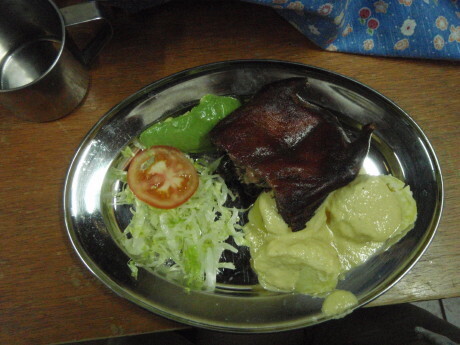 This one was cooked very well. 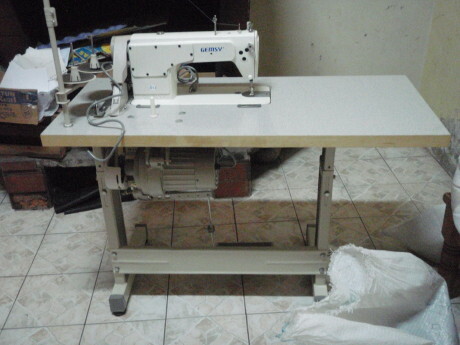 One of the community projects of the Foothill College students provided a couple of industrial sewing machines for use by all of the women of the community. 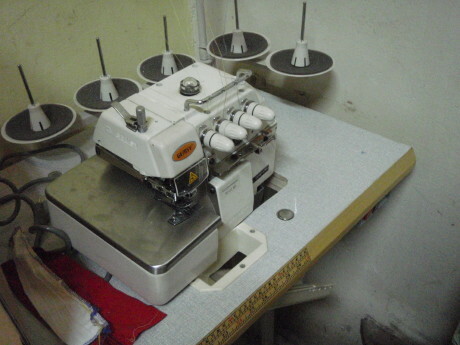 This one does straight stiches, but it will deal with heavy material. It is also one that has locally available parts and service. The other machine is a little different. It is designed to produce an interlocking stitch for extra strong joints. I'm not sure how it works, but between the two machines, the women should be able to make pretty much anything. After dinner at the Casa, we found that the busses had stopped running so 8 of us got a cab back to the Hacienda. The ride in the open bed pickup truck cost $3 total. I started a new fire and found that there were still hot coals in the fireplace from last night's fire. We pretty much finalized our packing and with a few minutes of packing last minute stuff, we should be ready to go. The bus is scheduled to leave at 1100, but only if everybody's paperwork is done. There were still two students unaccounted for. When last seen, they had been in Cayambe making photocopies. We've just had our last breakfast in the Hacienda. It was pretty typical, granola, eggs, toast, and juice. We're mostly packed. It'll take only a few minutes to wrap everything up to be ready to load onto the bus to Quito. Grant and Heather finally showed up with the last of the paperwork so that got done. Then there was a rather large party in the library/game room that lasted until about 0300. Sandy and I were sleeping instead. The weather this morning is virtually perfect, it should have been this nice while we were working. We still have 12 more days in Ecuador after today. This will be the last post from the Hacienda as we will have burnt up the last of our internet time as well.